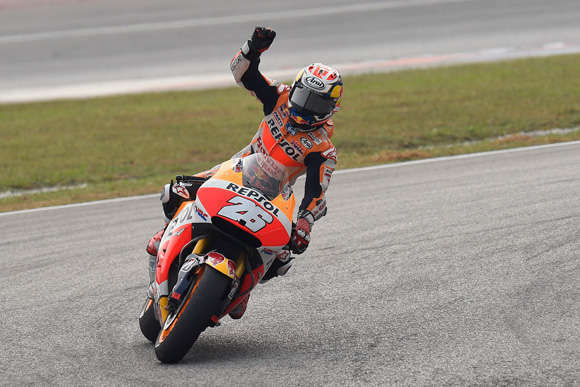 Honda MotoGP rider Dani Pedrosa (Repsol Honda Team RC213V) took an imperious start-to-finish victory in today’s Malaysian Grand Prix; making it two wins in three races for the Spaniard and completing a Honda hat-trick at the last three races at Motegi, Phillip Island and now Sepang. Team-mate and Australian GP winner Marc Marquez (Repsol Honda Team RC213V) was the victim of a controversial battle several seconds behind the winner. Disputing third place with Valentino Rossi (Yamaha), the reigning MotoGP World Champion crashed out after the title-leading Italian made contact with him. The incident was investigated by Race Direction who gave Rossi three penalty points for making ‘deliberate contact’ with Marquez, but the race result remained unaltered. Headlines about the battle between Marquez and Rossi, which had been simmering off-track all weekend, will inevitably and unfairly overshadow Pedrosa’s superb achievement. It was emphatic proof of the former 125 and double 250 World Champion’s return to full fitness and top-of-the-class form, after having to withdraw at the start of the season for arm-pump surgery. The factory Honda veteran of ten years missed three race and was still recuperating when he returned. He qualified on pole position for this race, the fourth time he has done so at Sepang. Seizing the lead into the first corner, he was never headed, eventually crossing the line 3.6 seconds clear of second-placed Jorge Lorenzo (Yamaha). It was his third MotoGP win here among seven podiums, plus two more wins in the smaller classes. Victory in Malaysia follows an equally masterful first win of the season (the 50th of his career) two races ago at Motegi in Japan. It also gained him one more championship place: now lying fourth, after having been as low as 15th on his return from surgery. Marquez’s disappointment followed directly after his own 50th career victory the previous Sunday in Australia. That was the fifth win this year for the 2013 and 2014 champion, whose chances of retaining the crown slipped away with a series of mishaps earlier in the season. He had qualified second on the grid for this race, and was still in touch with the leaders when his race was abruptly cut short on the seventh of 20 laps of the 5.543-km circuit. Gesturing in frustration, he returned to the pits simmering with anger. This latest misfortune and zero-points score does not, however, affect his championship position. Still able to show the dominant strength that swept him to two successive crowns, his five race wins mean he is a secure third overall. Cal Crutchlow (LCR Honda RC213V) took a strong fifth in the race, his fifth time in the top six in his first Honda season. The Briton was again the better of the pair riding the powerful Factory-spec Honda RC213Vs. His compatriot Scott Redding (Estrella Galicia 0,0 Marc VDS Honda RC213V) finished eleventh, three seconds short of his goal of adding another top-ten result to his scoresheet. Honda’s 2006 World Champion Nicky Hayden (Aspar Team Honda RC213V-RS) emerged victorious in an almost race-long battle for 16th with fellow Open-spec Honda rider Jack Miller (LCR Honda RC213V-RS). Twenty-year-old Australian Miller is currently one point ahead of veteran Hayden in the fight to be top Open Honda rider in the championship. Two more riders campaign Honda’s Open-spec machine. Eugene Laverty (Aspar Team Honda RC213V-RS) finished 19th, with Anthony West five seconds adrift in 20th. West was contesting his second race as stand-in for injury victim Karel Abraham (AB Motoracing Honda RC213V-RS). Already crowned champion in the all-Honda Moto2 class, Johann Zarco (Ajo Motorsport Kalex) waited until the last of 19 laps to pounce on pole qualifier and race-long leader Thomas Luthi (Derendinger Racing Interwetten Kalex). The French winner had saved enough of his tires in the blazing heat to draw more than half a second clear at the checkered flag. It was win number eight for the rider who has dominated the middle category, where all riders use race-tuned Honda CBR600 engines supplied by the organisers. Australian Grand Prix winner Alex Rins (Paginas Amarillas HP 40 Kalex) had been trailing the pair in third until half distance, at the same time fending off a determined Jonas Folger (AGR Team Kalex). Then the star rookie, who took over second in the standings from absent defending champion Tito Rabat (Estrella Galicia 0,0 Marc VDS Kalex), pushed too hard and crashed out. This left a lonely third to Folger, who already has two wins this year, and one other podium finish. Japan’s Takaaki Nakagami (Idemitsu Kalex) emerged victorious in a strong battle for fourth; eventually outpacing Italian teenager Lorenzo Baldassarri (Forward Racing Kalex). A furious Moto3 race saw the final result in doubt until the flag, with positions changing corner by corner, and seven riders over the line almost abreast, within just over half a second. It also saw kept alive a championship battle that many expected to have been over some races ago, as long-time points leader Danny Kent (Leopard Racing Honda NSF250RW) found himself shuffled to the back of that group. Team-mates Miguel Oliveira and Brad Binder (KTM) played tactics to close out the top two positions, pushing Jorge Navarro (Estrella Galicia 0,0 Honda NSF250RW) to third. It was the class rookie’s third podium finish of his first season, all in the last four races. Double race winner Niccolo Antonelli (Ongetta-Rivacold Honda NSF250RW), who had also led, was a close fourth. Enea Bastianini (Junior Team Gresini Moto3 Honda NSF250RW) was eighth, a little way behind Kent and narrowly ahead of Alexis Masbou (SaxoPrint RTG Honda NSF250RW). John McPhee (SaxoPrint RTG Honda NSF250RW) was only three seconds behind his team-mate, making a total of six Hondas in the top ten of this ultra-competitive class. Kent’s lead over Oliveira is now 24 points, with one race – offering 25 points for a win – still remaining. That season finale takes place at Valencia, Spain, on November 8, where both MotoGP and Moto3 titles will be decided.